World War One – Where were the women? Brighton was an important town during WW1. Within weeks of war being declared in 1914, the town had made a sober transformation. Out were the ice-cream stands and the renditions of ‘I do like to be beside the seaside’ and in was a new very straight faced Brighton as it slipped into its new identity as one of the most important hospital centres in Britain. With its position on the coast, it was inevitable that, when space to care for the wounded ran out on the Western Front and the decision was made to ship the injured back to Blighty, Brighton would be an obvious choice. Not so obvious perhaps, the decision to change the former Prince Regent’s Pleasure Palace, The Royal Pavilion, as well as the 1,500 seat Dome concert hall and Corn Exchange into hospitals. But that’s what happened. In fact, the Royal Pavilion Estate became a 700+ bed, state of the art military hospital complex. (BHASVIC, Brighton General Hospital and several private residences also did their bit.) In a piece of thinking that today sounds like an episode of ‘Mind Your Language’ or ‘It Ain’t Half Hot, Mum’ (for any readers under 40, these are 1970s ‘comedies’ that relied heavily on racial and national stereotypes), it was decided to make these buildings, built in an Indian style, into hospitals for, yes, you’ve got it, Indian soldiers. This knowledge isn’t as common as it should be but 1.3 million Indians fought alongside Britain during WW1. During the early months of the war Indians made up 20% of allied forces. To be fair, the Royal Pavilion Estate functioned as well as could be expected as an Indian hospital. 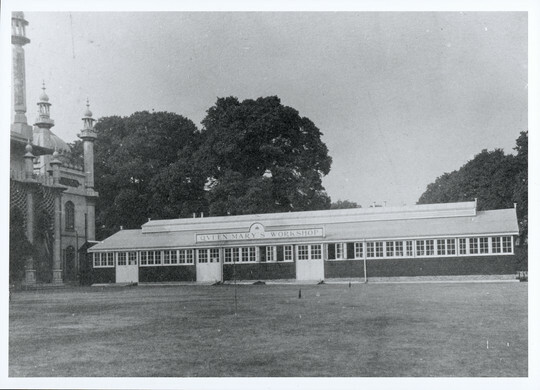 There were 9 separate kitchens to cater for the caste and religion driven dietary requirements, separate latrines, taps, bathing areas, facilities for worship, and carefully thought-out programmes of entertainment that included magic lantern shows, organ recitals, sports, games and trips to London. 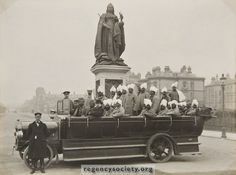 I love this picture, showing a party of Indian soldiers in a charabanc next to the statue of Queen Victoria in Hove. A colleague told me just the other day that they were going to Portslade. I would love to know what they were going to do there. Between November 1914 and early February 1916, then, when the Indian divisions were redeployed to the Middle East, over 4,000 soldiers had received the attention of ‘Dr Brighton’. Local people didn’t see as much of their Indian visitors as they would have liked. A high fence was erected around the perimeter of the estate and any interaction with the patients was tightly controlled. The best anyone could hope for was to take a ride on one of the double-decker trams that ploughed the Old Steine outside and try to peer over the side. 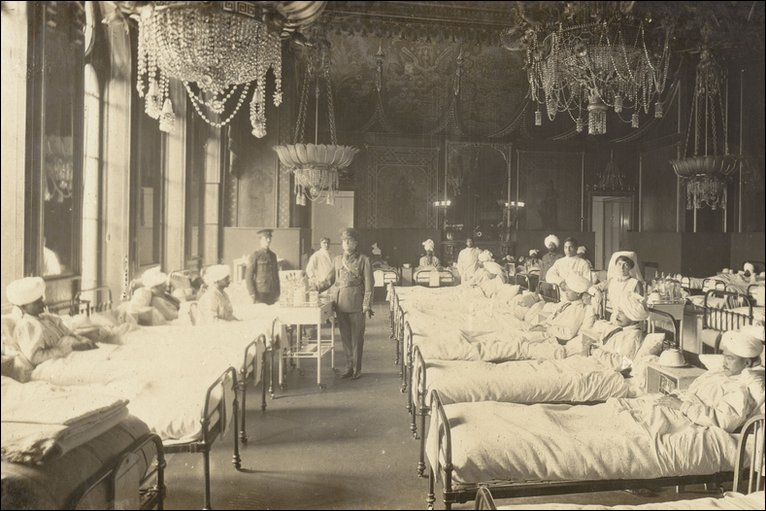 This picture shows the Banqueting Room converted into a hospital ward. Here is a picture of the workshops where men could learn skills such as motor engineering, typing and shoe-making. The other day while leading a tour around the estate that explored the role it played in WW1, a family showed me a picture of their relative, Daisy Simmonds, who is second from the left on the second row from the bottom. 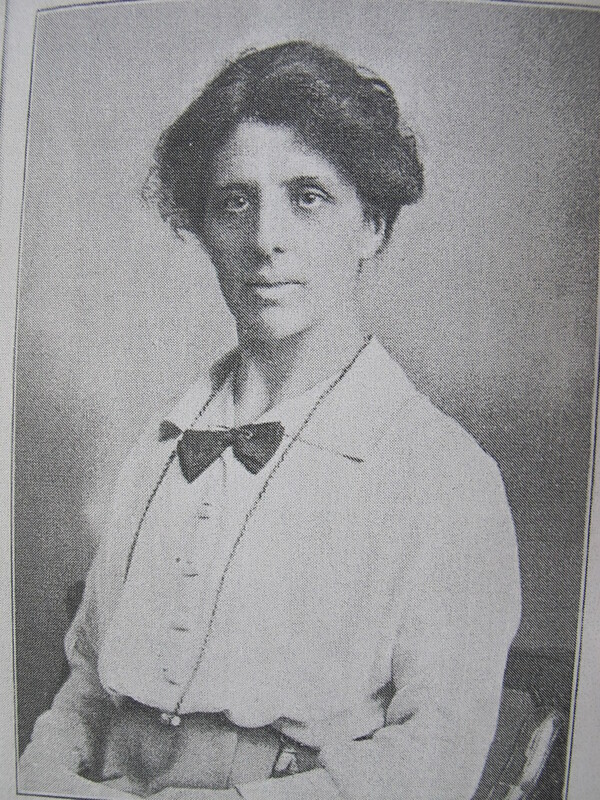 Daisy worked as a VAD (Voluntary Aid Detachment), a voluntary organisation of over 74,000 people, two-thirds women, who provided nursing services and worked as cooks, ambulance drivers, and took on other hands-on duties in military hospitals throughout the war. (http://www.redcross.org.uk/About-us/Who-we-are/Museum-and-archives/Resources-for-researchers/Volunteers-and-personnel-records is a good place to find out more). As a VAD Daisy worked at the Royal Pavilion hospital while also, apparently, maintaining a side career as a dancer at the Brighton Hippodrome. Thanks to the Dracott family for allowing me to show this photo here. 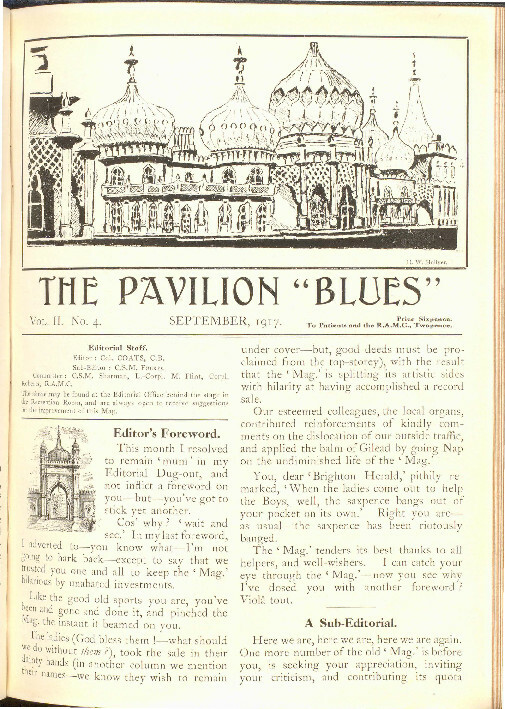 The ‘Pavilion Blues’ magazine (all available to download from http://www.images.brighton-hove-rpml.org.uk/assetbank-pavilion/action/browseItems?categoryId=1375&categoryTypeId=2&allCats=0&sortAttributeId=13&sortDescending=true&page=6&pageSize=25&filterId=-1) give a fascinating glimpse into everyday life in the Royal Pavilion Hospital for Limbless Men. Jokes, poetry, stories, reports on the regular sports days and hat trimming competitions (there was a lot to trim on a 1916 hat) accounts of tea parties in local benefactors’ gardens, visits by the local music hall stars of the day (including rising star Charlie Chaplin) and drawings give a glimpse of the doughty spirit that seems to have prevailed. Women, a hidden presence in the Indian hospital, now seem to be everywhere, from the ‘young ladies’ who ran the canteen and are always being praised for their gentleness and charm to the matrons. This is ‘The Matron’. One ‘Miss Caruthers’, who, we’re told, ‘is a descendent of Scotsmen’, but born ‘on the English side of the border within sight of the beautiful Cumbrian lakes and mountains’. Miss Caruthers, a member of QAIMNS, spent her career in hospitals in Huddersfield, various London hospitals, Netley and Dartford before arriving in Brighton where, according to ‘Pavilion Blues’, ‘she is now devoting herself, making it home from home for us’. 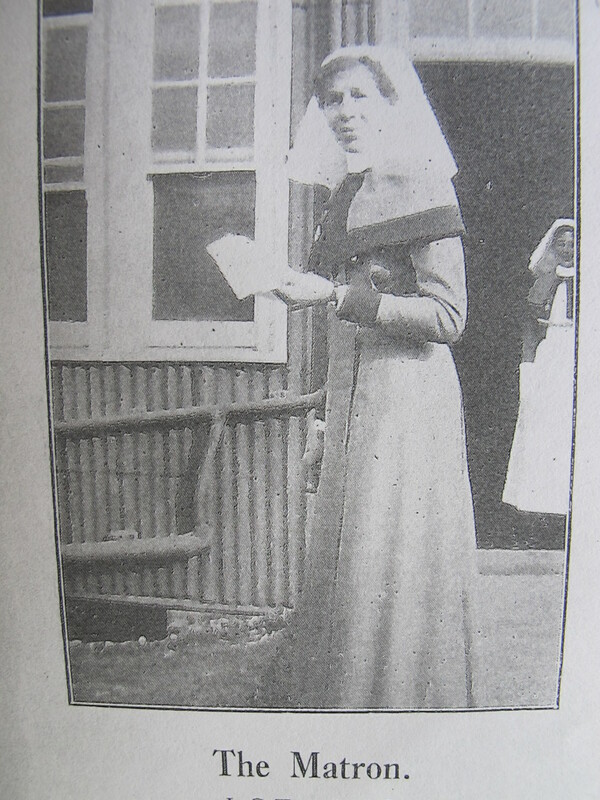 Another figure worthy of a whole page profile is ‘Mrs William Taylor’, who was in charge of the hospital post office. For any readers familiar with the Royal Pavilion, this was a small room immediately to the left of the King’s Apartments on the ground floor, in front of today’s buggy park and now obscured by a display cabinet. Not only was it a post office but a small cafe serving shrimp and watercress sandwiches, books, scones and tea. Mrs Taylor of Brunswick Square seems to have been another redoubtable presence, being the head of a club for laundry girls, working as a visitor for the Hove Relief of Distress Committee, the Prince of Wales’ Fund and being a ‘Woman Patrol’. These were volunteer policewomen who acted as aides to the established police. Without the powers of arrest they took on a more peace keeping role, patrolling local parks, public spaces and trying to nip would-be anti-social behaviour in the bud. Somehow, Mrs Taylor, described unsurprisingly as ‘a valuable organiser’ found the time to run the post office that, in the pre-texting and emailing world, must have been a lifeline to the injured men. ‘The efficient working of our post-office reflects the greatest credit on her and her able and zealous colleagues – to whom the boys are most grateful’, ‘Pavilion Blues’ says. 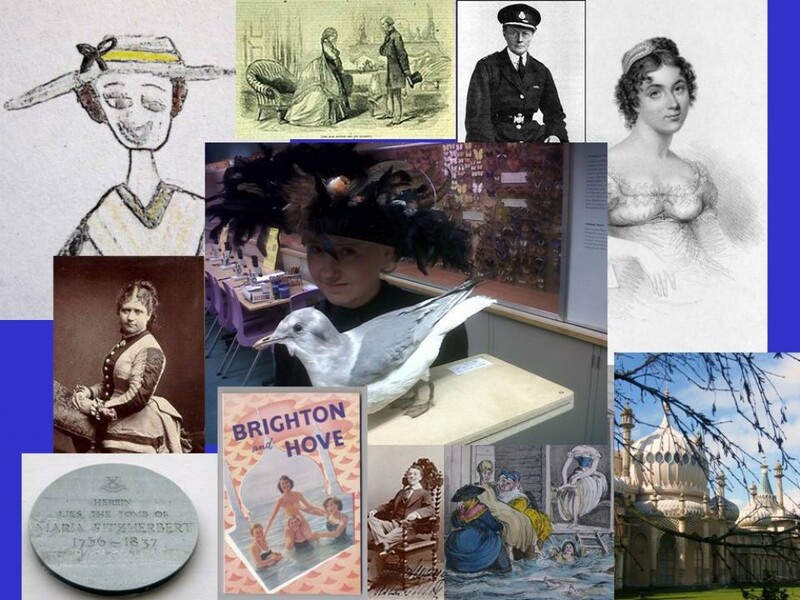 In Brighton, like most other towns, women were a rapidly growing presence in the working landscape. 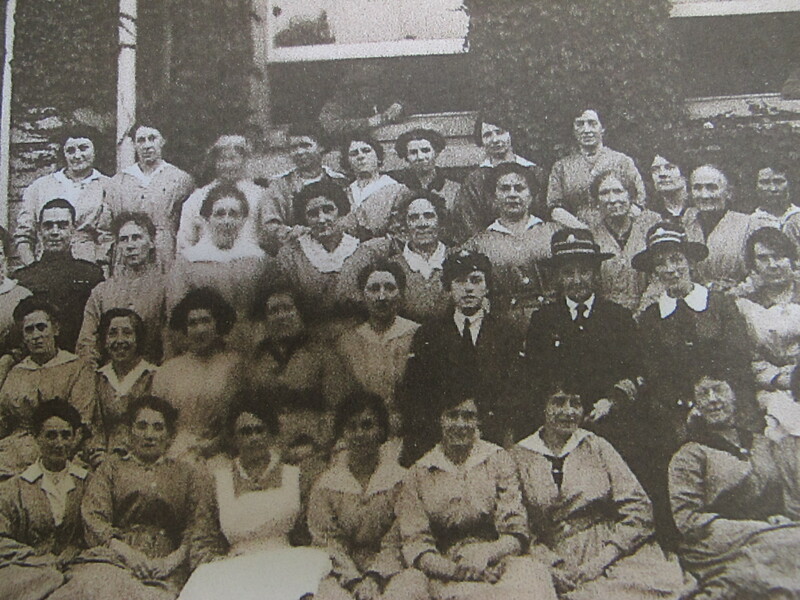 At the start of the war the number of British women in employment was almost three and a quarter millions. This had increased to almost 5 million by January 1918. Women could be seen engaged in agricultural work, transport and manufacturing. There are some wonderful pictures of women tram conductors and munitions workers in ‘Brighton in the Great war’ by Douglas D’Enno that can be browsed in the exhibition War Stories in Brighton Museum. This exhibition features the experience of several women and I will be telling some of their stories soon. This entry was posted in Uncategorized and tagged First World War, nursing, police, Royal Pavilion by historywomenbrighton. Bookmark the permalink. really will need to…HaHa). You certainly put a new spin on a topic that has been written about for decades.